View More In Dried Prunes. California grown dried plums. Naturally & artificially flavored. No added sweeteners. World's No. 1 prune. Good source of fiber. Prunes are deliciously fat free. Grower owned quality. The Amazing Prune: From the fertile valley of central California, Sunsweet Pitted orange Essence Prunes are succulent and sweet with an irresistible hint of orange flavor nurtured to perfection. So go ahead, live a little. Pop a few for a snack or into recipes and enjoy! Amazing Prune Fact: Prunes are deliciously fat free and 100 calories in each amazing serving. For more Amazing prune facts and healthy eating tips please visit us online. Fruit & Veggies: More matters. Please recycle. Diabetic Exchange: 2 fruit. Dried fruits have fiber along with carbohydrates and can be a good choice in your diabetic meal plan. 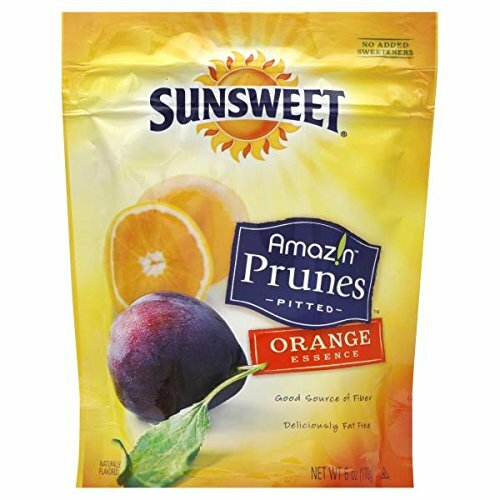 Sunsweet Pitted Orange Essence Prunes are succulent and sweet with an irresistible hint of orange flavor nurtured to perfection.